Amazon Go: The End of Jobs? Amazon Go is the latest job destroyer by virtue of the fact that it is a grocery store with no check-out lines. High tech devices will monitor every item you put in your high tech grocery basket so you just load up and go. Your credit card will be charged the correct amount. It isn’t clear if a robot will bag your groceries or if you’ll do that yourself. This feat of automation is only the harbinger of things to come. With artificial intelligence and robots, jobs will be automated out of existence except for a few software engineers who will design the various systems. So far there is only one store open and that’s in Seattle, but soon … soon check-out cashiers can kiss their jobs good-bye. By the same token, truck drivers will be losing their jobs to self-driving trucks. This technology is well along (it’s in beta as they say in the tech world). Already self checkout is underway at Home Depot and many supermarkets. Amazon Go is just taking self-checkout to the next level. 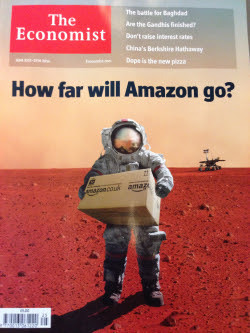 I suppose, if they’re out of an item, Amazon Prime will have it delivered to your house by drone within a few hours. Bank tellers have already been replaced by ATM machines although a few are still needed for those sticky situations that only a human can deal with. I suppose the shopping experience will also include text messages or alerts which sense what you want to purchase and then try to upsell you. Why buy that hunk of cheese when for just a few dollars more you could get artisan cheese made locally at a vintage shop? And as for coupons, that will all be handled electronically. You would just scan them with your smartphone, and they would automatically be deducted from your bill. As you continue to shop, Amazon would be gathering valuable information about your purchases so it can suggest other items you might be interested in. It’s not that retail tech companies haven’t already been hard at work tracking people as they explore physical stores and shops. A host of companies with names like RetailNext, Euclid, and Nomi, among others, are all part of this trend. It’s in a store’s interest to track people because they can target and upsell customers on more products and in-store promotions. 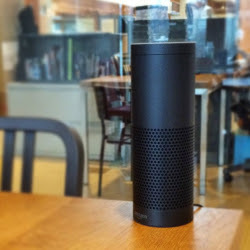 Alexa already responds to voice commands in your home. It’s not a stretch that this technology might be incorporated in your smartphone so all you’d need to do is say “Hey, Alexa, where’s the craft beer, and also I need a bouquet of flowers.” Then Alexa might come back and say, “Why don’t you get that special someone a box of chocolates too?” Then you’d say, “That’s a great suggestion, Alexa, I’d like a dozen red roses, but I want to have them delivered to her home on Valentine’s day.” Alexa would come back, “No problem, Mr. Mertz.” You see Alexa already knows the address of that special someone. Or why even go to the store? Just tell Alexa your shopping list and she’ll have it delivered within the next couple of hours. You’ll need a personal robot, however, to put all the stuff away. That’s maybe coming soon. Amazon is capable of deploying an array of cameras and sensors to control this whole process, but all it really needs is a souped up RFID (Radio Frequency IDentification). So instead of running each product through a bar code scanner, each product would have a label containing a little chip that would transmit it’s ID to a receptor wherever that receptor is located. It could be in the shopping cart or at the door. There might be a number of them located throughout the store. It’s a bar code on steroids. And for fast food – it will be automated too as advocated by Trump’s pick for Secretary of Labor (now defunct), the owner of Carl’s Jr and Hardee’s, Andrew Puzder. No need for minimum wage workers any more. Robots don’t require bathroom breaks or sick leave. Puzder can now get back to automating minimum wage workers out of his fast food chains. Cafe X is 100% automated from the ordering and payment system that can be from within the app or the order/payment screens on the front of the system to the preparation and delivery of the coffee. The system is by far faster than any current coffee shop experience. Once the amortization of the system has been met, the cost to operate this “coffee shop” is orders of magnitude lower than the 2.5 baristas a single system replaces. Franco’s barista was a robot. It’s part of an automated coffee shop called Cafe X — the latest example of the San Francisco’s dual infatuations: artisanal coffee and automated technology. Moments earlier, Franco had ordered her coffee using the Cafe X mobile app. Now a white robotic arm, the same kind used in car manufacturing facilities, was moving around a paper cup, pushing on syrup levers and brewing her a hot cup of coffee. On the speed front, Cafe X can make a hot espresso beverage in less than a minute and is able to pump out 120 coffee drinks in an hour. A Cafe X kiosk can occupy as little as 50 square feet, although its footprint in San Francisco’s Metreon shopping mall is a little over 100 square feet and was most recently home to another automated tenant: a Bank of America ATM. Encased in plexiglass, the kiosk contains two coffee machines equipped to brew Americanos, espressos, cappuccinos, lattes and flat whites. Customers can order their drink from the Cafe X mobile app or at one of two iPads mounted outside the kiosk. The entire transaction is cashless, and customers even get a notification on their phone when their coffee is ready. As of May 2015, the largest overall occupations in the United States, according to the Bureau of Labor Statistics, were retail salespersons (4.6 million), cashiers (3.5 million), and food preparation and service workers (3.2 million). Basically every job that doesn’t have to do with the FIRE (Finance, Insurance and Real Estate) sector or the military-industrial complex is in the process of being eliminated. However, janitorial jobs, child care and fruit and vegetable picking will probably always be with us. It might be hard to get anyone to fill those job positions as Trump plans to deport most of the people who have been doing them. Any job that could remotely be considered manufacturing will be gone. That’s why corporations are investing more in the US rather than abroad. However, their investments are not creating jobs; they’re eliminating them. During the recent Presidential campaign, much was said—most of it critical—about trade deals like the North American Free Trade Agreement and the Trans-Pacific Partnership. The argument, made by both Bernie Sanders and Donald Trump, was that these deals have shafted middle-class workers by encouraging companies to move jobs to countries like China and Mexico, where wages are lower. Trump has vowed to renegotiate NAFTA and to withdraw from the T.P.P., and has threatened to slap tariffs on goods manufactured by American companies overseas. “Under a Trump Presidency, the American worker will finally have a President who will protect them and fight for them,” he has declared. [But], such talk misses the point: trying to save jobs by tearing up trade deals is like applying leeches to a head wound. Industries in China are being automated just as fast as, if not faster than, those in the U.S. Foxconn, the world’s largest contract-electronics company, which has become famous for its city-size factories and grim working conditions, plans to automate a third of its positions out of existence by 2020.The South China Morning Post recently reported that, thanks to a significant investment in robots, the company already has succeeded in reducing the workforce at its plant in Kunshan, near Shanghai, from a hundred and ten thousand people to fifty thousand. “More companies are likely to follow suit,” a Kunshan official told the newspaper. The message is that blue collar jobs, jobs for those with only a high school education, are going bye-bye. There’s not much that Trump can do about it to assuage his Red State base, the “forgotten men.” So he will be left in the position of convincing them that those jobs have come back as an alternative fact of an alternative reality, something he and his cohorts are really good at. Machines are also getting smarter so that not only are they replacing manual laborers, but they are replacing people employed in white collar jobs as well. For instance, a highly skilled radiologist may soon be replaced by a machine whose powers of pattern recognition exceed those of humans. So while the doctor may find his job going by the wayside, his executive assistant’s job could be more secure. After all bringing him his coffee and delivering it with a smile is something far more difficult for a robot. The belief that the digital revolution, automation and robotization will create more jobs than they destroy is wishful thinking according to Charles Hugh Smith. Issuing more STEM degrees doesn’t create jobs for the graduates. This faith that technology will magically create more jobs than it destroys is wishful thinking. This theology arose as a result of the transition from low-skill agricultural labor to low-skill factory labor in the First Industrial Revolution (1750 – 1860, steam, railways, factories, etc.) and the Second Industrial Revolution (1870-1930) (mass production, electric lights, autos, aircraft, radio, telephones, movies). Each transition offered millions of new low-skill jobs to those displaced by technology and created increasing numbers of higher-skill jobs in design, technology, marketing and management. But history is not repeating itself in the latest Industrial revolution…. Since automation/software is now eating higher-skill jobs, advancing the skills of workers does not automatically create jobs for them. Pushing the entire populace to get a college diploma does not automatically create jobs that require college diplomas. The conventional narrative overlooks a key dynamic in the Third Industrial Revolution: the number of skilled workers needed to eliminate entire industries of highly skilled employees is much smaller than the work forces being eliminated. Some are suggesting that everyone needs to have a universal basic income since their labor power will not be needed in the future. Robert Reich thinks that there has to be a way to recycle money from the owners of the robots to all the people those robots will displace so that money can continue to circulate and the American economy which depends 70% on consumption will continue to function. How else are consumers to consume unless they have the wherewithal to do so? Researchers estimate that half of all US jobs will be automated in the next two decades. Smith disagrees with Reich because he doesn’t believe that taxing the Googles, Facebooks and Apples of the world will generate enough money to support the masses in a super welfare state. Besides that he doesn’t believe that just being a consumer can ever satisfy human needs for having productive and dignified work. A society of people who do nothing but consume will lead not to a utopia but to a dystopia because human beings have a need to be something more than just consumers. But perhaps both Smith and Reich miss the point. There is no need to recycle money from the taxation system to provide a basic income for everyone. A Central Bank that was controlled by the people instead of by Wall Street, which is what we have now, could generate money the way Abraham Lincoln did. Lincoln endorsed the printing of $450 million in US Notes or “greenbacks” during the Civil War. The greenbacks not only helped the Union win the war but triggered a period of robust national growth and saved the taxpayers about $14 billion in interest payments. Instead of debt based money created by Wall Street through loans, the government could just print and distribute it directly to the people. Quite an insightful article. When automation was first introduced it was touted as a tool to keep everyone employed at the same pay but with fewer hours worked thereby allowing everyone more leisure time. Greed at the top overtook this thinking and turned it into more profits for wealthy business owners. The article mentioned fruit and vegetable pickers always being with us, however, Europe has large scale efforts in advanced stages of development to eliminate those jobs as well. Andrew Puzder, the defeated nominee for Sec’y of Labor and still CEO of Carl’s Jr, said he favored robots because they’re never late to work and don’t get sick. Can we next expect drones armed with leaf blowers, buses programmed to stop at Carl’s Jr. but not Rosa’s Taco Shop? Robots who’ll show up to vote for us? I’M ONE OF THE LUCKY ONE NO ROBOT WOULD PUT UP WITH MY CUSTOMERS SOME ONE STILL HAS TO THINK ABOUT FIXING CARS AND DO THE WORK. HOLE ALL IS WELL IN CALIFORNIA. EXCELLENT article and INSIGHT JOHN. This is at once an enlightening and intimidating vision of one possible future for American Society and its’ economy. Certainly if the future has millions of robots there will be tens of thousands of robot installers and repairmen (and women). There will be financing companies and banks with new loan programs just for the booming robot manufacturers and end-users. 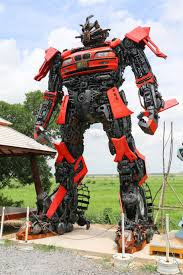 Likewise robot designers and their necessary IT support staffs will experience high growth as happened when automobiles entered mass production. Mass production will put huge demands on raw material suppliers for the robot factories. There will be markets for discounted used robots and new opportunities for hmmm… used car salesmen (and women). Rental retailers will open Cleaner-Bots stores for those periodic household chores. Security companies will sell Bot-Guards to occupy the home or vacation home when the owner is away. Already a brick and block laying robot has been invented, in fact several have, and they are very fast and accurate. 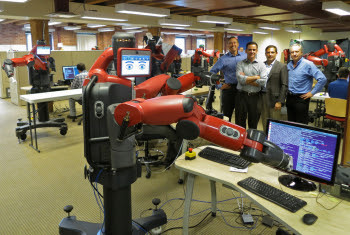 A building contractor can now bid jobs for his robot to complete. Perhaps a couple of bricklayers combine their funds and buy one. Then cart it from site to site, load it and configure it for the desired job. How about a Chef-in-a-Bot that can prepare 100 different exotic meals? Someone has to know how to cook so the bot can be taught. Chef-in-a-Bot has to have a restaurant, but that is owned by a human. Farmer-in-a-Bot has to have a farm, but that too is owned by a human farmer. Mechanic-in-a-Bot is ready to work but the car repair shop is owned by a human. Attorney-in-a-Bot is ready at the court house, but needs a human to sue. All of the imaginable robots to service all the imaginable sectors of the economy have one thing in common, they need a human to buy them and then employ them. That human has to sell the robot labor and production to other humans at a profit and a price that will be relatively less, probably much less, than today. So perhaps many jobs disappear, but many opportunities arise for independent business and professional people to start their own firms with less capital and overhead than is required today. In the future a gardener will arrive on the job with his robot, rather than his tools, likewise the plumber, painter, builder, mechanic, house cleaner — even waiter. Thanks John, keep sending your amazing articles. Wendy’s and Pandera Bread are adding kiosks so that customers don’t have to interact with minimum wage workers since the owners don’t want to pay the rising minimum wages.